Researchers from the University of Copenhagen have discovered DNA traces from a wolf on the carcass of a dead deer found on the Danish island of Funen last year. It is the first time since 1813 that a wolf has been confirmed to be roaming the Danish territory outside Jutland. The dead deer was found on April 9 by Sabrina Haaning, a volunteer from Ulvetracking.dk, an organisation that investigates and reports wolf sightings in Denmark. Haaning discovered the carcass while walking her dog and was vigilant enough to collect both saliva and a sample of flesh from the deer’s wounds. The exact location of the dead animal, which sustained bites to the neck, has not been revealed. Carsten Rahbek, a professor of biodiversity at the Natural History Museum, believes wolves have come to Denmark to stay, if humans don’t interfere. It’s not yet clear how the wolf got to the island. The obvious answer is that it crossed over the Little Belt Bridge, but it could very well have swum across from Jutland. According to Rahbek, wolves are excellent swimmers and can swim up to 13 kilometres. Since 2012, when traces of wolves were found in Jutland for the first time in 200 years, numerous sightings have been reported. 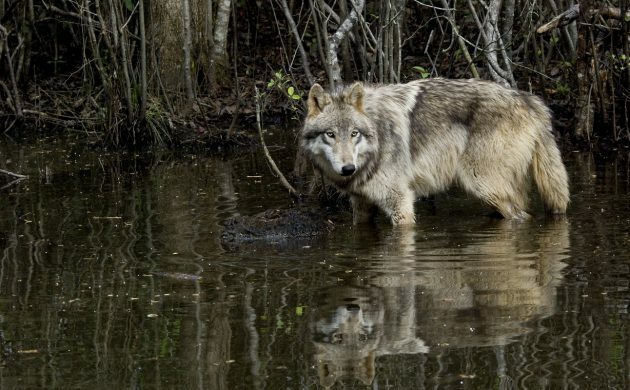 Researchers estimate that at least four wolves have now settled in the Denmark permanently.